Not only a children's tale, but also a cautionary children's tale with an underlying message that will appeal to all ages. Coraline, the eponymous heroine of this story immediately stands as one of history's great animated females, intelligent, wise and resourceful, she shows that you don't have to be a princess, live in a castle or have a knack for fashion to save the day. The film functions as a crafty cautionary tale on the perils of getting what you want, whether it’s a pair of gloves or a new family. Yet the dazzling colors and unhinged imagination of Selick’s visual palette also have the effect of rendering “Coraline’s” fantasy world that much more eye-ticklingly and dangerously seductive. 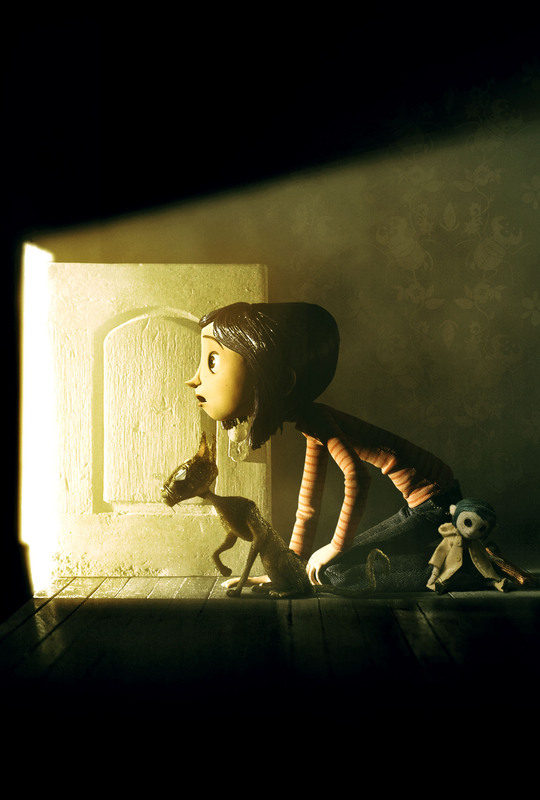 Coraline tells the story of a young girl, who feeling neglected by her parents after moving to a run-down apartment, finds a tiny door that leads to an alternate dimension. Within it she finds her apartment now beautifully furnished and her parents, attentive and loving, but why do they have buttons where their eyes should be? It doesn't take long for Coraline to realise that there's a price to pay for this perfect world, and when her 'other-mother' tells her that she has to stay forever and have buttons sewn into her eyes too. Coraline finds herself in a race against time to save herself as well as her real parents. On the promotional literature for Coraline there's a claim that could almost feel like a gimmick, it's the first animated film to be shot entirely in 3D. However in the careful and capable hands of Henry Selick this lovingly crafted children's tale merges new technology with traditional animation methods to deliver a spectacle that should make both adults and children alike giddy with delight. Generally speaking, I believe that the whole story of Caroline intends to conclude that we as adults or kids or teenagers (in all ages) should accept our real world. We all achieve that luxurious world in our dreams but nothing is as precious as our own family and our health. It's our duty to take care of our eyes to see bright parts of our life. The sight of darkness is nothing more than exchange of beautiful bright part of our life. I really love this animation and I suggest everyone watching it. thank you, Leila, for your complete, brief and adequate review. I am so glad you wrote about this animation. I watched it today and I can say it's an amazing film!